Manheim Maulhand is the innkeeper at the Inn of Ill Omen. He sells food and rents beds. 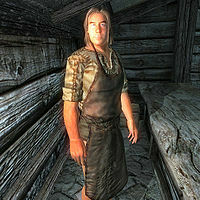 He will buy stolen goods from any character (even characters who are not in the Thieves Guild), because he is one of the few vendors with a Responsibility of 30 or less. This is effectively only useful for players with high mercantile skill: the journeyman skill perk is necessary if you want to sell him anything other than potions and ingredients, and investing in his store is necessary for him to have more than 50 gold available. He will spend day and night attending to his inn, behind the check-in counter. He never stops to eat or sleep and offers his services at any time. Manheim only wears a blacksmith's apron. However, he carries the rest of his clothes in his inventory: iron boots and greaves. He is armed with a leveled warhammer and a small amount of gold. Business is bad for Manheim so when you arrive at the inn he will be incredibly surprised: "Well I be a spotted snow bear, a customer!" When you first speak with Manheim, he will be quick to get you to buy a room: "We got plenty of rooms if you want one. Ain't nobody here 'cept old Rufio." Asking about the inn will reveal his thoughts on it: "It's a horrible name for an inn, I know. But I just can't bring myself to change it. Besides, I like the sign." Asking about Rufio will reveal some information on the tenant: "Rufio? He's an old codger. Been living here for a couple of weeks now. If you ask me, he's hiding from something. But what do I care? He pays his tab. His room is downstairs, in what I like to call the Private Quarters. Use that hatch in the floor over there. But don't expect a warm reception." When ending the conversation, he has three different dialogue options: If his disposition is between 20 and 29 (he will attack you if it's lower than 20), he will exclaim: "Go on, now! Get out of my Inn! I don't need your kind hanging about!" Or if it is between 30 and 69, he will say: "Farewell! And tell your friends! The Inn of Ill Omen is open for business, as always." Or if it is above 70, he will say: "Goodbye my friend! And remember, you're always welcome here! Minerva, one of the regulars at the inn, will mention Manheim saying, "The only people that stay here are stragglers on the Green Road. Me, I got no place else to be. Besides, I think Manheim is sweet on me." If her disposition is low toward you, she will become upset and say, "You make me sick! Now get out of here before I have Manheim throw you out!" Manheim will refuse to talk to you or provide any services if his Disposition towards you is less than 30, saying I don't care how bad I need the business. You ain't welcome here. Since he will not talk to you, persuasion is out of the question; however, a charm spell can boost his disposition enough for you initiate the persuasion minigame and permanently alter his disposition towards you. He will equip his clothes when he starts combat. For some unknown reason he only has one fatigue point.